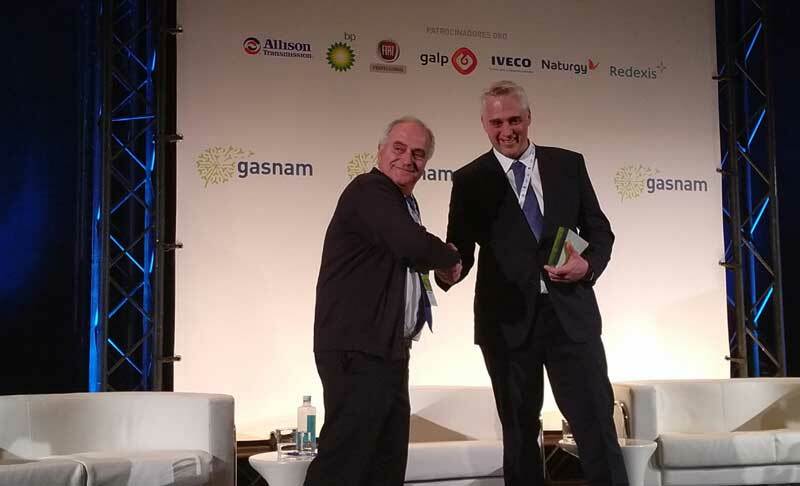 HAM Group has been awarded during the VII Gasnam Congress, where it has been awarded the prize in the category of Environmental Entrepreneurship, being considered a pioneer in the promotion of natural gas in mobility. Almost 40 years ago we started in Badalona as a company dedicated to the transport of dangerous goods by road and from our beginnings we have always opted for compressed natural gas, liquefied natural gas and vehicular natural gas as an environmentally friendly source of energy, with the objective of reducing local and global emissions, compared to other types of more polluting fuels. HAM currently consists of 9 companies, all related to natural gas in different areas, ranging from engineering, road transport, CNG and LNG service stations, the commercialization of liquefied natural gas, the maritime sector, the rental of vehicles that operate with CNG … We have become a leading company and reference for the rest of the actors in the gas sector, acting throughout Europe through our subsidiaries HAM Italia and LNG France, as well as in South America with HAM Peru, that allows us to manage our growth in Latin America. The award ceremony, presented by the environmental journalist Arturo Larena, took place at the La Nave Madrid venue, during the Annual Congress that Gasnam celebrates between April 10 and 11, an event that has been consolidated as an essential event and a meeting point among the main representatives of the natural and renewable gas sector for land and maritime transport; among which are companies and administrations committed to the development of gas, with the aim of achieving the decarbonisation of transport. The VII Gasnam Congress has had this year with more than 1500 m2 of indoor and outdoor exhibition, where among other proposals has highlighted the Mobile Unit of HAM Group, characterized by its large flow for industrial applications, for being fully automated and autonomous. It is a mobile station with a LNG tank of 20 m3, GNLC pump of 55lts / min, generator set, 6000 lts of high pressure bottles in 2 stages and direct line, atmospheric gasification system, ventilation system, 2 NGV1 dispensers with mass counters, built-in payment system and other innovative properties. In Grupo HAM we continue working daily to offer a better service to all our customers, as well as to preserve the environment. This year we are developing more than twenty projects related to gas, reinforcing and consolidating our presence in the sector.